Who'd say no the deal of a lifetime? Tony Abbott would, and it's our tragedy. The ten year bond rate is the rate at which the government can borrow for ten years at a fixed rate of interest. Right now its just 2.55 per cent, an all-time low. By way of comparison in the 1970s it exceeded 10 per cent, in the 1980s it passed 16 per cent, in the 1990s it passed 10 per cent, in the 2000s 5 per cent, and until now in this decade it has usually been above 3 per cent. It dived below 3 per cent at the end of last year and is now just 2.55 per cent, the lowest in living memory. If Australia was to borrow, big time, for important projects that took the best part of a decade to complete, it would have no risk of ever having to fork out more than 2.55 per cent per year in interest. The record low rate would be locked in, for the entire ten years. Australia's inflation rate is currently 2.3 per cent. Although it will almost certainly fall in the wake of the collapse in oil prices when it is updated next week, the Reserve Bank has a mandate to keep the rate centred at around 2.5 per cent. That means that right now our government is being offered billions for next to nothing, billions for scarcely more than the expected rate of inflation. If Abbott was the chief executive of a company with good prospects he'd grab the money and borrow as many billions as he could without impairing his credit rating. In Australia's case that's probably an extra $100 billion. That's enough to build the long-awaited Brisbane to Sydney to Melbourne high speed rail line, or to build Labor's original national broadband network, or to build Sydney's $11 billion WestConnex road project plus Melbourne's $11 billion metro rail project plus Melbourne's $16 billion East West Link plus something big in each of the other states. And it would cost next to nothing. All each of these projects would need is a positive real rate of return (which several of those listed above lack) and we would get ahead. All we would need is confidence in the worth of our ideas. It's happening because interest rates in the rest of the world have dropped to near zero. Japan's ten year bond rate is 0.24 per cent, Germany's is 0.40 per cent, Britain's 1.54 per cent. Even in the United States where the economy is improving, the ten year bond rate is just 1.81 per cent. Without the ability to earn decent returns in the nations to our north investors are flocking to here and buying our government bonds. In order to get them they are prepared to bid down the rates we have to pay them to all time lows. It mightn't last. 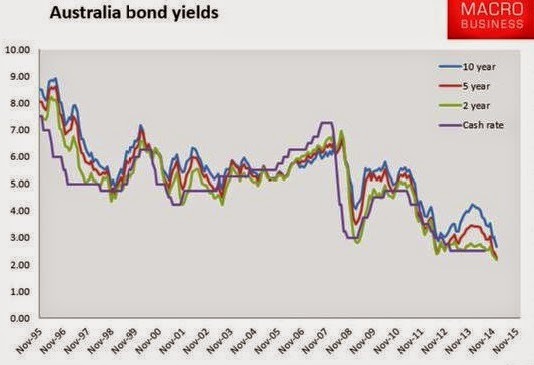 In October Reserve Bank assistant governor Guy Debelle warned of a "relatively violent" correction in bond markets. He said as soon as it looks as if interest rates will climb, the purchasers of bonds will demand much higher rates in order to cover themselves for what's likely over the next ten years. The opportunity will vanish. If we are prepared to grasp it, there's no shortage of projects that would set us up for decades to come. In education, in health, in the delivery to railway lines into suburbs that are at present barely accessible - in all of these areas there are projects whose benefits would exceed their costs and exceed them by more than enough to pay the minimal rate of interest being demanded. Some are visionary. Bank of America Merrill Lynch economist Saul Eslake says if Australia was to get serious about reducing its dependence on coal it would consider paying coal producers to close, and speeding up the commercialisation of battery technologies that would allow Australians with the next wave of solar panels to live off the grid. The risk is that bad projects would be chosen over good ones and the money wasted. Abbott himself provides reason for concern. Despite promising during the election to "require all Commonwealth-funded projects worth more than $100 million to undergo a cost-benefit analysis by Infrastructure Australia" his first budget funded scores of road projects without such approval. Some of the cost-benefit studies weren't even published, in others the figures were massaged to make them look better than they were. The Grattan Institute's John Daley suggests setting up an independent statutory authority along the lines of the Reserve Bank to vet proposals for spending big money. Its members would be appointed by the Governor-General for terms of five to seven years, it would report directly to parliament and it would publish of all of its findings compete with the assumptions behind them. He says even cheap money should be spent well. Could the Coalition grab the opportunity before it vanishes? There are some good signs. With help from the Greens it axed Labor's debt ceiling. Since taking office it has run up an extra $78 billion in debt. But it is unorganised, behind in the polls and a prisoner of some of the silly things it said about debt while in opposition. We have a once in a lifetime opportunity. It'll slip through our fingers.
. 2012. Hockey wants to hold down the debt ceiling. What could possibly go wrong?
. 2010. Debt free. Got any other ideas to stifle growth?